Ever since I bought the Impulse I’ve stopped riding the Tiger on trails. The light weight of the Impulse makes things so much more enjoyable than wrestling with the heavy Tiger. Anyway, I’m not skilled enough to effortlessly manage the heavy adventure motorcycle off road like they show the pros do in YouTube videos. The other problem with my road biased Tiger 800 XRx is it’s tyres. The motorcycle came with tarmac friendly Metzeler Tourance Next tyres which are not at all optimal for off road use. Thanks to the crazy high torque of the Tiger 800 cc engine, a slight twist of the throttle would incite the rear tyre to spin out of control in dirt. The traction control setting in off road mode did its bit to alleviate the problem. But only to an extent. I needed to feather the clutch precisely to get the motorcycle riding smoothly, which is easier said than done while bouncing on uneven terrain. It was just too much physical stress and mental tension. It killed the joy of riding a motorcycle off road. 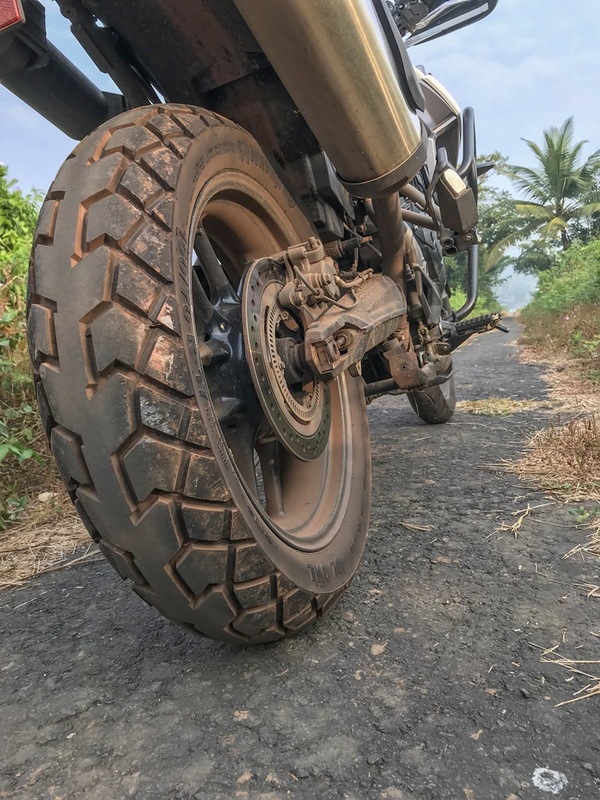 When time came to change the tyres of the Tiger, I toyed with the idea of using an aggressive off-road tyre. Something like the Continental TKC 80. But then I realized that most of my riding was on tarmac and I now indulge is only light off-roading on my short morning and evening rides. I could continue with the same Metzeler tyres. But since my morning and even rides are usualy solo, I didn’t want to get stuck with the Tiger without any usable traction and no help from anyone. So I made the decision to stick to the Metzeler Tourance Next for the front and a Continental TKC 70 for the rear. The TKC 70 is a compromise between road and off-road. After riding the Tiger on and off road for some time now I think I’m in a position to offer my two paisa on the combination. Long story short, it works. At least for my kind of riding. While cornering a motorcycle on tarmac a lot of the weight gets transferred to the front wheel. Add the fact that the Tiger is a front heavy motorcycle, this puts a trememdous amount of load on the front tyre. So it needs as much contact with the tarmac as possible to avoid a spill. So I stuck with the Metzeler Tourance Next for the front wheel. After putting the TKC 70 on the rear wheel, I find that traction control kicks in a lot later than it used to when I had the Metzeler on. This tells me that the tyre is offering a lot more traction and I can feel it as well. I don’t need to mess with the clutch too much now, which is a relief. The TKC 70 tyre has a hard center with softer rubber on the shoulders. So this means I get longer life on highways as well as a decent amount of traction on corners. So far, I’ve not experienced any loss of stability while cornering on tarmac. I would strongly recommend this combination for a road biased adventure motorcycle. You end up getting the best of both worlds. Confidence on tarmac and a respectable amount of traction while riding off-road.